You normally go sailing for a weekend or midweek, sometimes anchored without access to shore power so you need enough power to cruise for two days. You also desire a range of comforts onboard, including a large refrigerator, microwave/oven combination and high-end coffee/espresso machine. Internet and email facilities are on your wish list as is (partial) navigation using your laptop, a good sound system and occasionally watching your favourite TV show. Your navigation station includes a GPS, plotter, speedometer and depth gauge. Your yacht has several pumps for water, shower, toilet and bilges. You require optimum ease of operation; not only centrally located but also next to your bed or in the engine room. One of the advantages of using a Mass Combi is the ability to power loads even when mains supply is limited by using energy from your batteries. For example, a 10 A load can be powered from a 4 A shore connection. In addition, the design of the Mass Combi is both unique and characteristic of Mastervolt. Rather than installing heavy transformers, our lightweight, high-frequency technology offers major benefits regarding size, weight and sound (no hum!). The technology also ensures an exceptionally high efficiency with a minimal conversion loss and a low no-load consumption. The included battery temperature sensor will make sure the batteries receive the best possible charge. The Mass Combi meets all your requirements and more! The total of AC and DC consumers requires around 1 kWh per day (2 kWh in total). Totally discharging the batteries is not advisable so opt for a maximum of 50 % discharge = 4 kWh. Taking into account the various appliances and required peak loads we suggest a 12 V system. The required battery capacity is 4 kWh/12 V = ± 330 Ah. 280 Ah needs at least 25 % of the battery capacity for charging power, so in this case we chose for a 60 A charging power via the Mass Combi. The Mass Combi has a battery charger that allows you to safely, quickly and completely charge two battery banks; starter and service batteries can be separately charged. Additionally the Mass Combi can be used to convert the power for your AC applications, so using everything simultaneously is also possible. This touchscreen control panel is easy to read and operate. The grey button turns the display on or off or locks it, while all other functions can be controlled using the touchscreen. The products in this system communicate with each other via MasterBus. This brilliantly simple platform for communication and connections ensures that all components ‘speak’ the same language. The result is a single communication protocol with high-speed CANbus technology. MasterBus integrated battery monitor, with detailed information on the status of your batteries for an optimised charging process, incl. voltage, current, time remaining and consumption capacity in percentage. 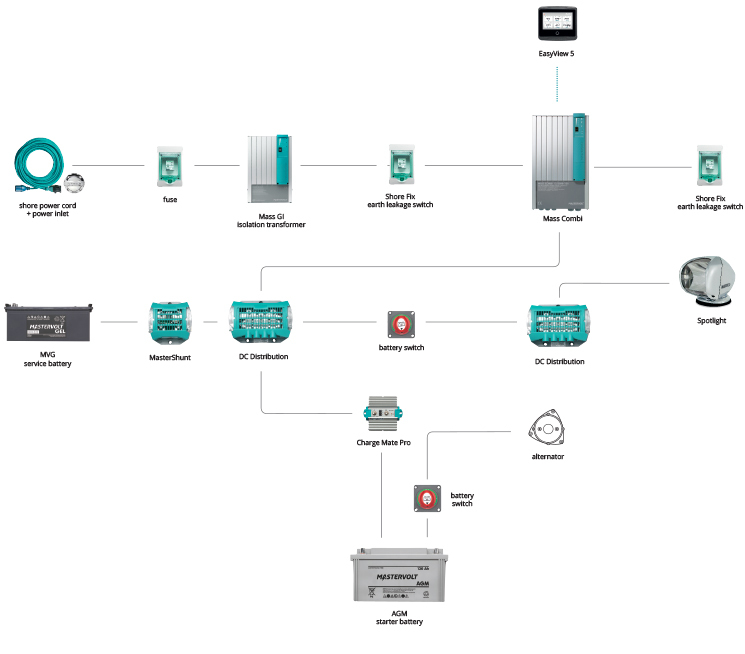 This distribution model connects up to four DC devices to the DC groups, such as a battery charger, inverter, alternators and solar panels. 1 x AGM 12/130 starter battery. 1x Mass GI 3.5 kVA/16 A; lightweight isolation transformer for safely using shore power, vital for steel or aluminium vessels to avoid electrolysis and corrosion. 1 x Charge Mate Pro; the ultimate solution for charging several batteries simultaneously, compatible with any type of alternator/charger. 4 x Shore Fix, 16A/30mA earth leakage switches. 1 x shore power cable 16 A, 25 m.
1 x shore power inlet 2+PE, 16A/230V. 2 x battery switches for switching on and off the consumers attached to the battery. 1 x Spotlight Chrome; the most versatile, durable, consistent and easy-to-use spotlight on the market.